Whenever you need to interrupt a localization process, for whatever reason, or just to switch to a subscription with fewer strings, you can simply downgrade your POEditor acccount. How do I downgrade an account? 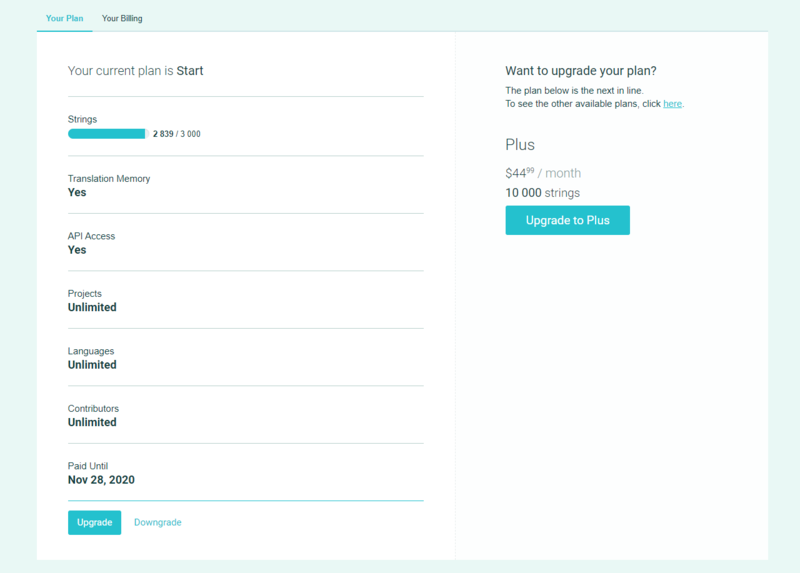 Just go to the Billing section in your account and, in the Your Plan tab, click the Downgrade link, next to the Upgrade button. If you have a free plan, you will not see that link. What happens to my data when I downgrade? Nothing. We will not touch any of your data. In case you'll want to resume your localization process, you will find all your localization projects just as you left them, with all the translated strings and contributors. Please note that, if after the downgrade the number of strings in your accout exceeds the new string limit, you won't be able to add more strings to the localization project. Will the downgrade take effect immediately? The account's string limit will be decreased after the last day of your paid subcription is over.